Many treatment centers now realize yoga’s benefits and offer regular classes. Some yoga classes even incorporate 12-step meetings. However, any type of yoga instruction and practice can be a beneficial addition to a treatment program. Use of yoga in addiction recovery programs. Yoga is a physical, mental and spiritual discipline originating in India. It is most often conducted in a class where physical postures (asanas) are led by an instructor. Comprehensive classes usually include breathing exercises (pranayama), meditation and relaxation. Yoga can be safely practiced by anyone if it is taught by a seasoned instructor. But some practices are more strenuous than others and may not be appropriate for the elderly or those who have physical limitations. Yoga can help people in recovery learn how to calm themselves without the use of alcohol or drugs, in addition to improving mental and physical health. Help cope with trauma. Some teachers specialize in trauma-sensitive yoga education. Certain practices (yoga nidra) have been studied for their positive effects on PTSD. Calm the mind. Meditation and guided relaxation, which are used in some yoga programs, help to slow down an overactive mind, improve self-awareness and provide an opportunity to rest if sleep is disturbed. Expose recovering users to a drug-free setting.Traditional classes are taught in calming environments. Improve fitness. Physical yoga postures help to increase physical flexibility and strength. Yoga is usually practiced in a class setting, and this intentional community can provide additional recovery support. While some yoga classes now offer a 12-step focus, any professionally led class should offer an environment that is free from judgment and encourages self-exploration. Many addiction treatment centers now incorporate yoga into their programs. Yoga can help promote inner peace, manage impulses and boost energy. Yamas (social discipline) and niyamas (self-discipline), yoga’s ethical and moral codes, can provide organization and structure on how to live life in recovery. They are behaviors and practices intended to guide participants on how to relate to other people and cultivate inner peace. This information is usually not introduced in a beginner class, but is good to know. Yamas – Ahimsa (non-harming), Satya (truthfulness), Asteya (non-stealing), Aparigraha (non-possessiveness), Brahmacharya (maintaining vitality). Niyamas – Tapas (purification using discipline), Santosha (contentment), Saucha (purity), Svadhyaya (self-study), Ishvara Pranidhana (devotion to a higher power). Yoga classes are geared toward a wide variety of participants. Classes offered inside a treatment center may be structured differently than classes offered to the general public. A period of sitting quietly. Instruction in warm-ups and formal postures. A relaxation period at the end. You may also be instructed in specific breathing exercises and be offered time for meditation. Yoga can be gentle, vigorous or something in between. Experiment with different classes, styles and teachers until you find what feels comfortable to you. Some basic postures and a few of their effects are listed below. 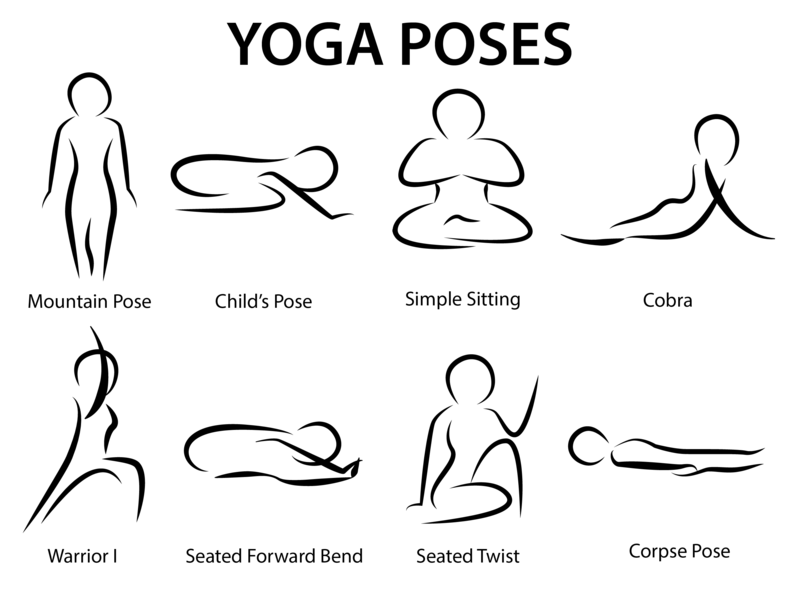 Postures are listed by common name followed by the Sanskrit name. Sanskrit is the language of yoga. Mountain (Tadasana) – improves posture, creates strength and gives a sense of groundedness (the foundation for all standing poses). Warrior I (Virabhadrasana) – a posture of strength and stability. Child’s pose (Balasana) – releases tension and encourages feelings of safety. Seated forward bend (Paschimottanasana) – stretches the entire back of the body and fosters calm. Seated twist (Ardha Matsyendrasana) – energizes the spine, and stimulates the liver and kidneys. Cobra (Bhujangasana) – increases spinal flexibility, and opens the heart and the lungs. Simple sitting (Sukhasana) – promotes calm. Savasana (corpse pose) – relieves stress, lowers blood pressure and reduces fatigue. These are just a few examples. Depending on who you ask, there are said to be over 1,000 yoga postures. Remember that all postures, even the simple ones, may not be appropriate for certain people. An easy sitting pose may not be right for someone with damaged knees. And while lying on your back sounds great, it isn’t recommended for someone with low back issues. Skip postures or ask for modifications for things that don’t feel right for you. Looking for a Program That Offers Yoga? Who Answers? to learn more about recovery centers in your area that include yoga as part of their program. Wear comfortable clothing. You do not need special yoga clothes. Wear layers so that you’ll be comfortable at all stages of practice. Consider bringing your own mat. Most facilities provide mats, straps, cushions and blankets. But you may want to buy your own mat if you think you might be participating in yoga on a regular basis. Don’t eat a heavy meal before class. If you need to eat, a light snack is best. Make sure you don’t have any health conditions that could interfere with yoga practice. Get clearance from your medical provider if you have any specific health concerns or limitations. Come with an open mind. Be willing to ask questions and let your instructor know of any concerns you have. Yoga can be part of a program in a residential treatment center, a high-end rehab or an outpatient setting. You may experience yoga as part of a larger exercise or wellness component to your treatment. You may be fortunate enough to be offered individualized sessions. As previously mentioned, a brand of yoga is linked with 12-step recovery (Y12SR), so that may be your introduction to yoga. You have the right to ask about the credentials of your instructor. Some programs will only employ yoga teachers who are members of Yoga Alliance. This organization is a registering body, so it has no investment in training or educating its members. Ask where your teacher was certified and what his or her experience is. Early recovery is a time when you will be developing boundaries and a renewed sense of self-worth. It may feel uncomfortable to ask questions, but you owe it to yourself to develop this ability not just in a yoga class but in your recovery process. If you or a family member is in need of substance abuse abuse treatment and would like to incorporate yoga into your recovery, call 1-888-319-2606 Who Answers? to speak to a trained treatment support representative. This person can address your concerns and answer questions about treatment options. They can also provide information on ways to pay for services. Blog: We Know Yoga Helps People in Recovery… But How?
. International Association of Yoga Therapists. Contemporary Definitions of Yoga Therapy.
. Khanna, S., & Greeson, J. M. (2013). A narrative review of yoga and mindfulness as complementary therapies for addiction. Complementary therapies in medicine, 21(3), 244-252.
. Büssing, A., Michalsen, A., Khalsa, S. B. S., Telles, S., & Sherman, K. J. (2012). Effects of yoga on mental and physical health: a short summary of reviews. Evidence-Based Complementary and Alternative Medicine, 2012.
. Harvard Health Publications, Harvard Medical School. (2009) Yoga for anxiety and depression.
. Benson, Herbert, MD, and Klipper, Miriam Z., (1975). The Relaxation Response. New York: Harper Collins.